"ABC Monstrosity" is a freaky drawing experiment designed to thrill adults and kids alike with colouring pages that teach and terrify all at once. As each new letter is introduced with a drawing of a familiar object or animal, the previous ones are continuously combined to create bizarre monstrosities. Flip the book to see the same weird narrative play out in a simple 1-10 sequence, called "123 Monstrosity" featuring staples of good parenting that morph into crazy re-combinations. All the text in the books are hand drawn, giving it a funky comic book flavor. This is my second book. Just like "Alice In The Womb," "ABC Monstrosity" is printed locally on quality drawing paper, which has been tried and tested by my growing audience of fans. It also includes another zany glossary. Once again, fascinating scientific facts are augmented with humor, but in this section of the books the tables turn. The detailed monstrosities have goofball nonsense definitions, and the science behind how we might define ordinary features in our lives is surprisingly complex. I first began combing libraries for innovative, inspiring children's literature when my first daughter was a baby. I was sometimes inspired, but often dismayed by how little many authors seemed to care about attention to detail, and I started drawing these books just after becoming pregnant with my second little girl. I wanted to create something that was just as interesting for me to look at over and over as it would be for them. ABC Monstrosity is both hideous and hilarious, because creepy creations make colouring into something not directed just at children, or adults. This book is fun for everyone! 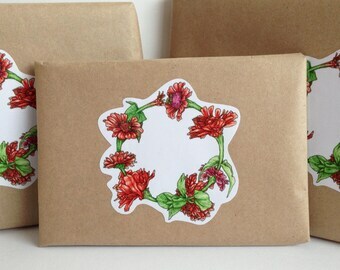 Bought these sweet Zinnia wreath stickers to go with my order. So lovely and Christmas themed - though suitable for the rest of the year too. Just had to have this for a friend who is an octopus lover. It is so bright and dramatic. Once again this artist's work is delightful. It would be fun in a child's room too. Such a unique little book - a rare mix of simplicity and psychedelia. You can feel the artist's appreciation for the beauty of a body at peace. The DYI feeling of the hand sewn together zine give this book a pleasant underground alternative vibe, the kind that makes you feel like you're in on a secret. My yoga group was all over it! Clever packaging too. A wonderfully illustrated ABC coloring book for children and adults. 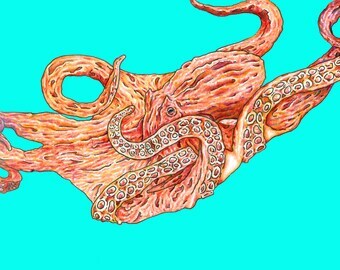 A creative twist on the traditional ABC's book beginning with a single drawing and ending with a colossal monstrosity. Flip the book for a delightful 1-10 counting book.